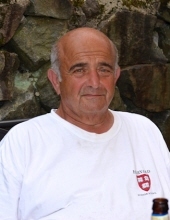 BEVERLY - Ronald J. Fortunato, 76, of Beverly, passed away peacefully, Monday evening, October 15, 2018 at the Kaplan Family Hospice House in Danvers. Born in Melrose, he was the son of the late Joseph and Louise (Witham) Fortunato. He grew up in Beverly, surrounded by a large loving extended family of Aunties, Uncles, cousins, and grandparents. He was a graduate of Beverly High School with the class of 1962. Ron was a foreman and manager at the General Electric in Lynn for many years. He also enjoyed being a barber, a skill passed down from two generations, and he was still offering haircuts to friends. Ron was an active member of the Italian Community Center, Patria e Lavoro Society and the Bass Haven Yacht Club, all in Beverly. Ron was his happiest when reaching out to those in need. He filled and delivered countless Christmas baskets to families who would otherwise not have had a meal on Christmas Day. He and his cousin, Tony Witwicki, enjoyed working side by side with family and friends; purchasing, preparing, and serving monthly meals to the homeless at the First Baptist Church in Beverly. Ron had a lifetime love of the ocean and boating, and enjoyed the company of his many friends at the boatyard. Surviving him are two sons, Randy Fortunato of Springfield, Michael Fortunato and his wife Erin of Beverly, one daughter, Rena Springer and her husband Jeff of Salem- also one brother, Donald Fortunato and his wife Lorraine of Danvers, two sisters, Donna Gauthier and husband Ronald of Essex, and Joanne Vallone and husband Michael of Georgetown and three grandchildren, David Callely and his wife Haley, Craig Denehy, and Griffin Fortunato, and one great grandchild, Emmelyn Callely. Visiting hours are at the Campbell Funeral Home, 525 Cabot Street, Beverly on Sunday, October 21, 2018 from 1-4 PM. The funeral Service will be held at the funeral home on Monday, October 22, 2018 at 12 Noon. Relatives and friends are invited to attend. Interment will be held privately. To send flowers or a remembrance gift to the family of Ronald J. Fortunato, please visit our Tribute Store. "Email Address" would like to share the life celebration of Ronald J. Fortunato. Click on the "link" to go to share a favorite memory or leave a condolence message for the family.